Sidney’s Caleb Harris high fives Trey Werntz after a dramatic run during a nonconference game against Urbana on Wednesday in Sidney. 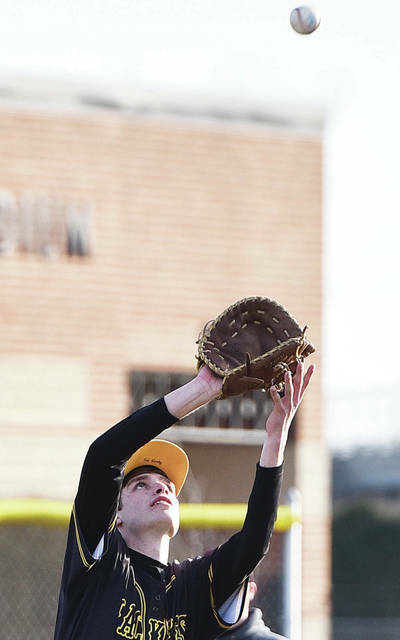 Sidney pitcher Mitch Larger throws during a nonconference game against Urbana on Wednesday in Sidney. Sidney's Trey Werntz waits for the throw in a pick-off attempt of Urbana's Levi Stapleton during a nonconference game against Urbana on Wednesday in Sidney. Sidney's Trey Werntz catches a pop fly during a nonconference game against Urbana on Wednesday in Sidney. Sidney's EJ Davis slides into third as Urbana's Daniel McKenzie catches the throw during a nonconference game against Urbana on Wednesday in Sidney. Sidney's Trey Werntz dodges a ground ball as Urbana's Nick Weyrich fields a hit during a nonconference game against Urbana on Wednesday in Sidney. Sidney's Carson Taylor swings during a nonconference game against Urbana on Wednesday in Sidney. 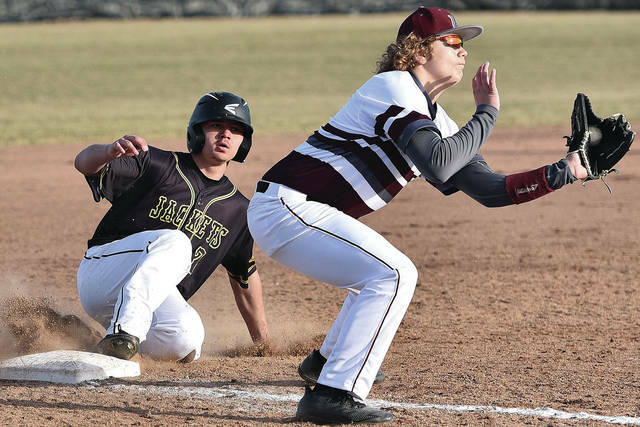 Sidney's Ryan Schloss runs towards second as a ground ball gets past Urbana's Austin Rooney during a nonconference game against Urbana on Wednesday in Sidney. 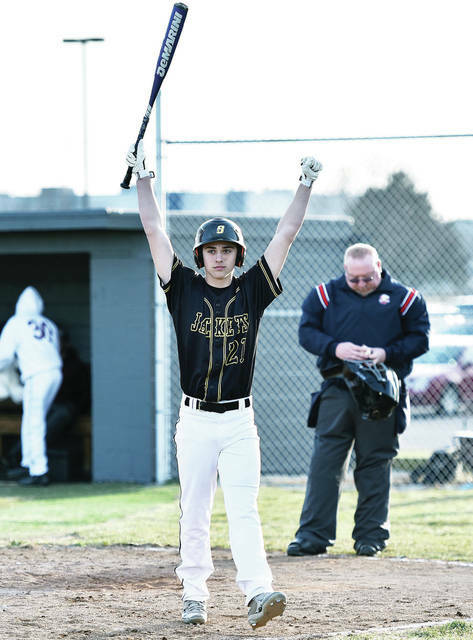 Sidney’s Jarron Kelley celebrates at the end of a 10-0 run-rule win over Urbana on Wednesday in Sidney. Kelly was at the plate when EJ Davis scored on a wild pitch to end the game after five innings. 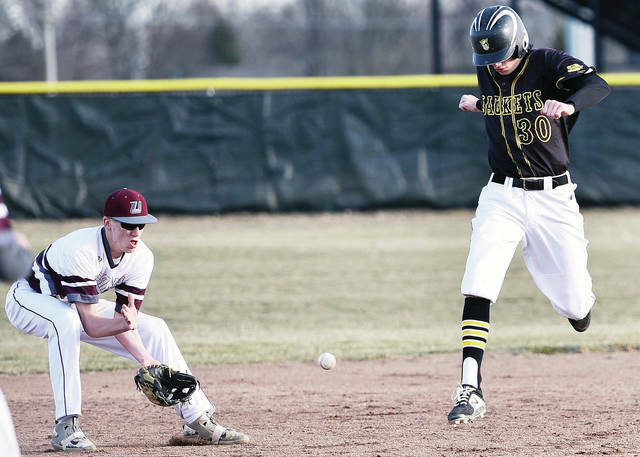 Sidney's Caleb Harris slides into second as Urbana's Austin Rooney waits for the throw during a nonconference game against Urbana on Wednesday in Sidney. 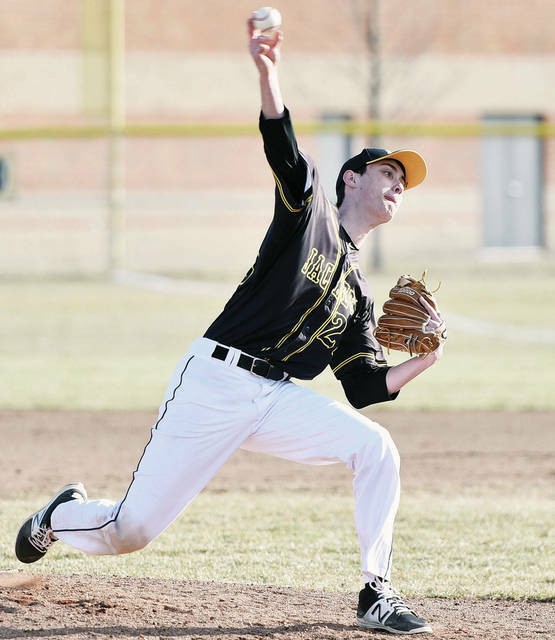 SIDNEY — Sidney couldn’t get going in the first inning of a nonconference season opener against Urbana on Wednesday — but it was the only inning they couldn’t. 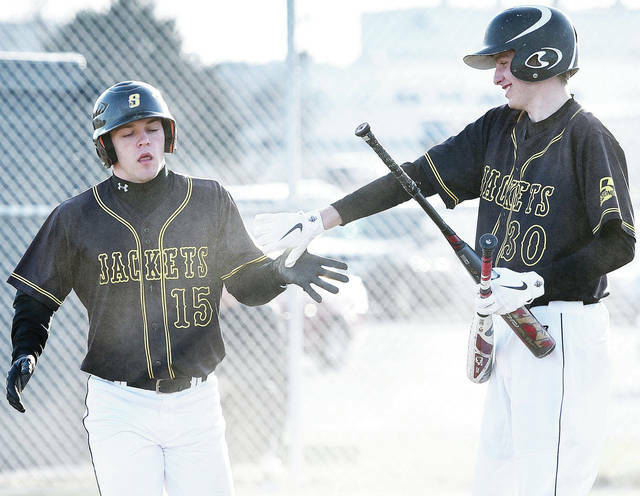 The Yellow Jackets racked up 10 runs in the next four innings to earn a 10-0 victory in their season opener. Sidney had seven hits, drew six walks and took advantage of two errors by the Hillclimbers to pull away. After a scoreless first inning, Sidney jump-started the victory with five runs in the second. Trey Werntz was hit by a pitch at the start of the inning, then Ryan Cagle drew a walk. Brandon Rose hit a line-drive single to right field to score Werntz, then Mitchell Larger was hit by a pitch. E.J. 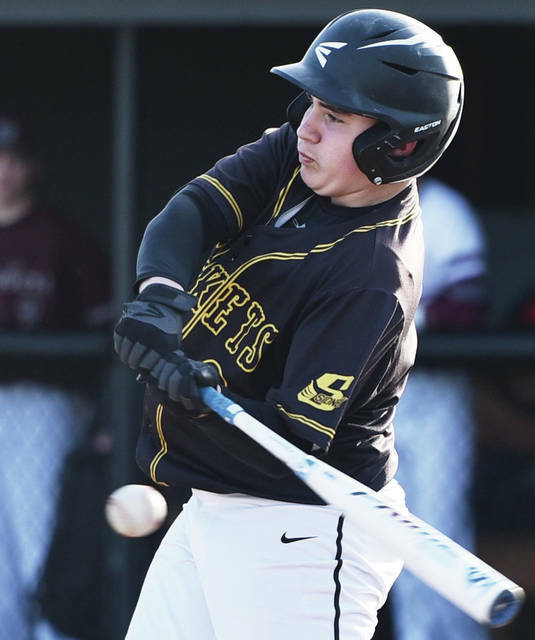 Davis hit two-run single to center field to put the Yellow Jackets up 3-0, and Caleb Harris followed two batters later with a two-run single to left field. Rose drove in a run on a fielder’s choice in the third inning. Davis led off the fourth with a walk and later scored after stealing second and third and advancing to home plate on a wild pitch. Darius Boeke hit an RBI single and Lathan Jones drove in a run on a fielder’s choice before the inning was over to boost the lead to 9-0. Davis forced a run-rule win in the fifth. He reached first on a fielder’s choice, advanced to third on a single by Ryan Caufield and scored on a wild pitch. Larger picked up the win on the mound. He allowed two hits and struck out 11 batters in four innings with three walks. The Yellow Jackets earned a close win in a nonconference match on Wednesday in Sidney. Prem Dev won 6-0, 6-0 at first singles. Grant Hoying won 6-1, 6-0 at second singles and Broc Bey lost 6-3, 6-0 at third singles. Jersain Brux and Kazuma Okada won 6-3, 4-6, 7-5 at first doubles and Isaiah Brux and Tyler Overholser lost 6-0, 6-0 at second doubles. Lehman Catholic won a nonconference match on Wednesday in Lima. Danny Lins lost 7-5, 4-6, 10-6 at first singles. Sam Gilardi won 7-5, 6-1 at second singles and Mikkel Alvarez lost 6-3, 6-3 at third singles. Sean Toner and Cole Kramer won 6-3, 6-1 at first doubles. Elias Bezy and Max Schmiesing won 6-2, 6-2 at second doubles. Sidney’s Trey Werntz waits for the throw in a pick-off attempt of Urbana’s Levi Stapleton during a nonconference game against Urbana on Wednesday in Sidney. Sidney’s Trey Werntz catches a pop fly during a nonconference game against Urbana on Wednesday in Sidney. Sidney’s EJ Davis slides into third as Urbana’s Daniel McKenzie catches the throw during a nonconference game against Urbana on Wednesday in Sidney. 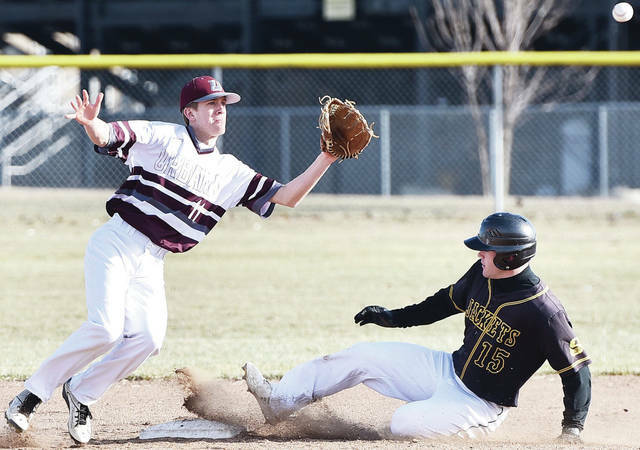 Sidney’s Trey Werntz dodges a ground ball as Urbana’s Nick Weyrich fields a hit during a nonconference game against Urbana on Wednesday in Sidney. Sidney’s Carson Taylor swings during a nonconference game against Urbana on Wednesday in Sidney. 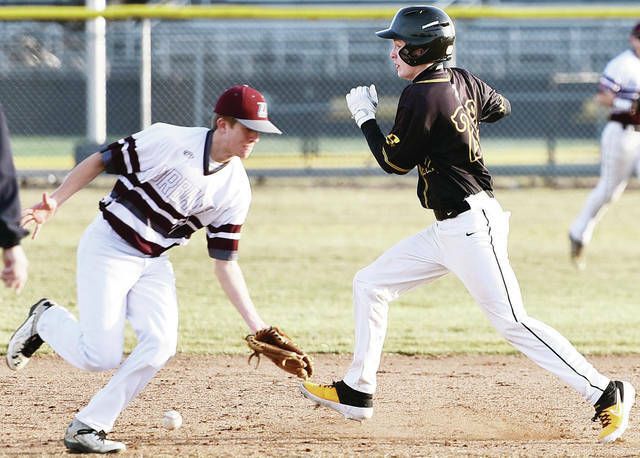 Sidney’s Ryan Schloss runs towards second as a ground ball gets past Urbana’s Austin Rooney during a nonconference game against Urbana on Wednesday in Sidney. 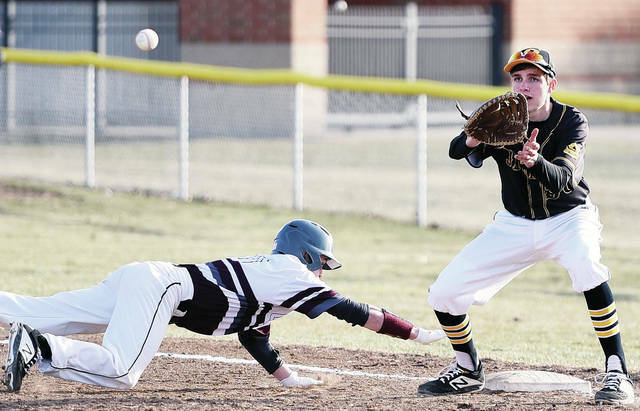 Sidney’s Caleb Harris slides into second as Urbana’s Austin Rooney waits for the throw during a nonconference game against Urbana on Wednesday in Sidney.